… from a Superb Lyrebird recorded by me at Mt. Airly, NSW, 30 May, 1995. This extract is from a sequence that lasted over half an hour. Equipment used, Sony TCD D10 DAT recorder, Sennheiser ME67 gun mic. 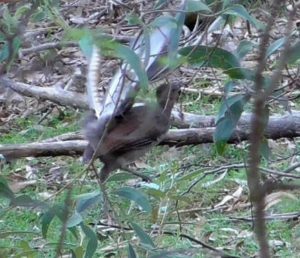 photo: Superb Lyrebird displaying at Mt Airly 18 January, 2016.
audio: Superb Lyrebird singing at Mt Airly 30 May, 1995 (3 minute sample). *Download some lyrebird facts in pdf format (436 kb) here. Superb Lyrebird territorial songs from 23 locations of the Central Tablelands and Upper Blue Mountains of New South Wales. This songmap shows where I have recorded lyrebird songs since 1987. To hear the song from any one location, go to the list beneath the map and click on the sound icon. 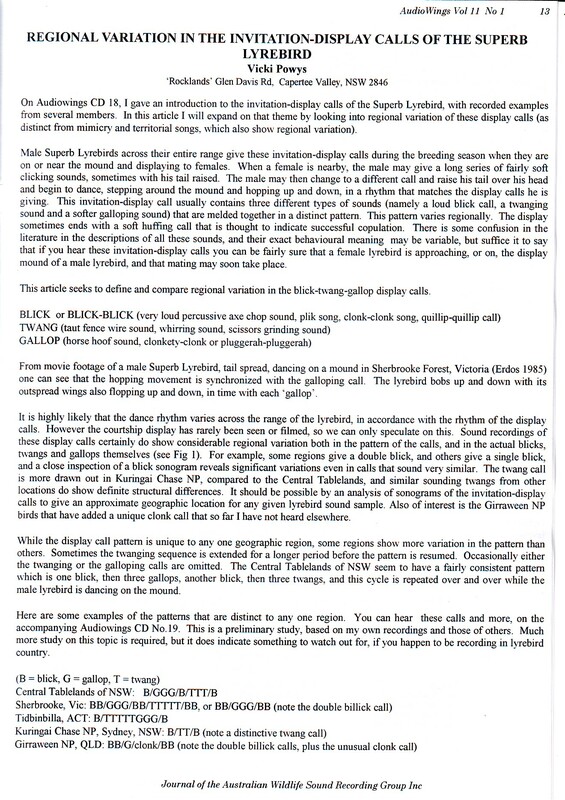 This draft study was created in 2006 and is an extension of my earlier paper on lyrebird songs published in the journal ‘Emu’ in 1995. Note that lyrebird territorial songs are unique to any one geographic location and change very little over time, for example the songs from Mt. Airly have stayed pretty much the same over a 30 year period from 1988 to 2018, (more about Mt. Airly at the bottom of this page). 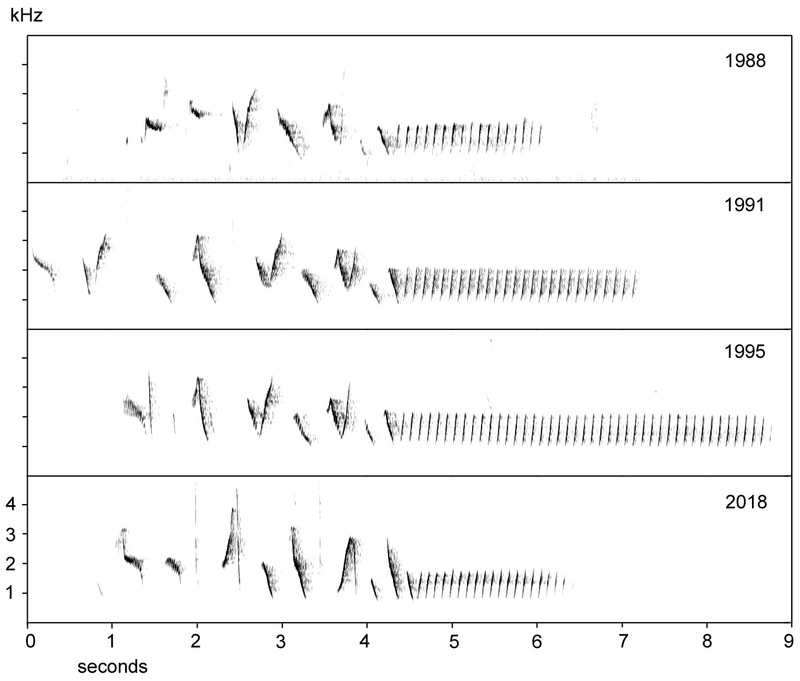 … was published in Audiowings, the journal of the Australian Wildlife Sound Recording Group, in July 2008. These calls are the strange twanging, whirring and clicking sounds made by male Superb Lyrebirds. Sounds are included at the end of the article. Here are some typical sounds of invitation-display calls. The clip starts with twanging, then develops into the blick/gallop/twang pattern typical of lyrebirds in the Central Tablelands of NSW. This bird was recorded at Baal Bone Gap west of Lithgow NSW, 5 July, 1995. 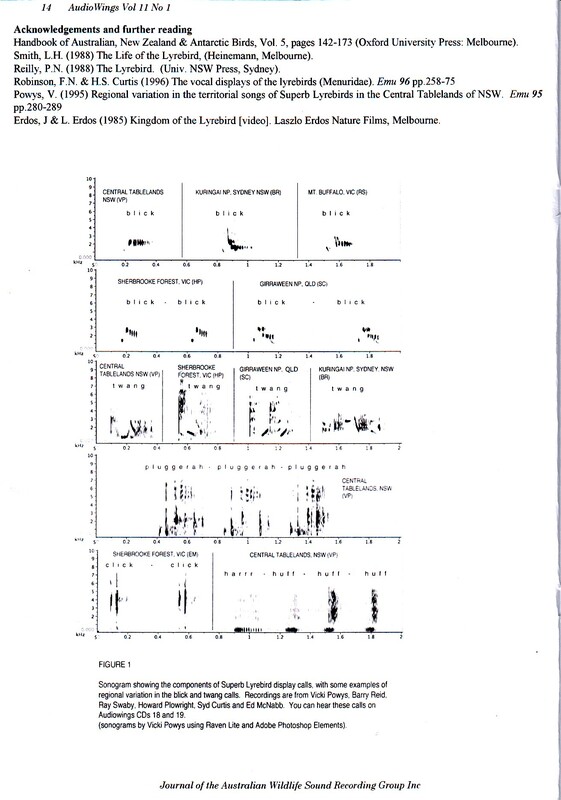 Here are some clicking calls, recorded near Ben Bullen, west of Lithgow NSW, 8 July, 1995. And lastly, these seldom-heard choofing or huffing calls were recorded at Dunn’s Swamp near Rylstone NSW, 28 June, 1999. 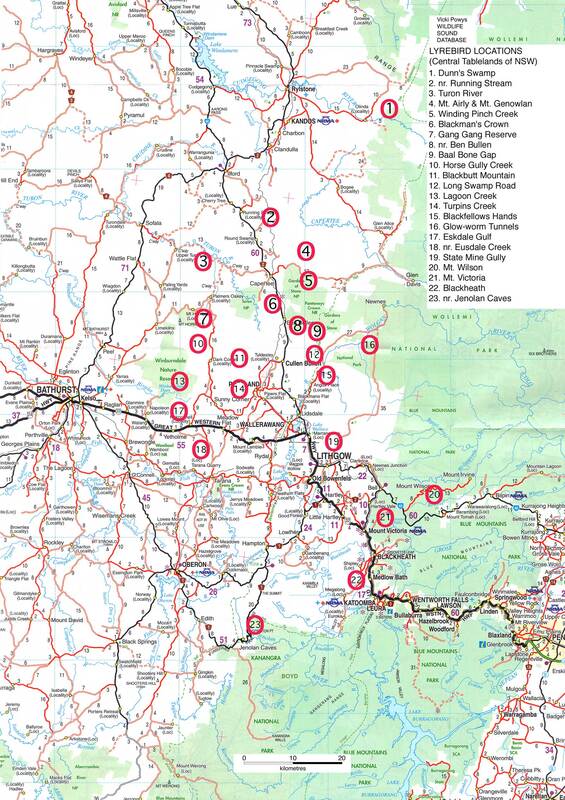 Similar calls have been recorded in other areas of the Central Tablelands of NSW. The territorial songs at Mt. Airly have not changed in 30 years (1988-2018). I have been regularly recording the songs and calls of Superb Lyrebirds at Mt. Airly (near Capertee, NSW) from 1988 to 2018. In 1988 I used a microcassette recorder, then progressed over the years to better equipment – and better recordings. I present here (with sonograms and audio clips) a collection of territorial songs spanning a 30-year period, to show song similarities over time. Mt. Airly lyrebirds have two different territorial songs that feature a series of repeated notes; one version sounds like rapid bubbling, the other has a series of slower chu-chu-chu notes. Both types occur during bouts of singing from any one bird. The introductory up-down notes show some variation over time, but the main part of the song (for both song types) has not changed structurally over the years. 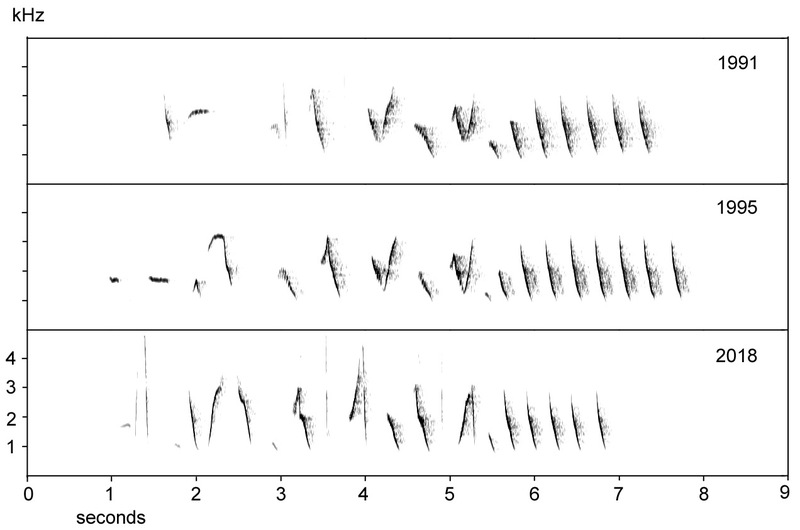 Note that for any one bird and year, the number of territorial song syllables varies during a bout of singing. I did not record a ‘chu’ song for 1988. 1988 – 22 September, afternoon. 1991 – 14 June, 1.28 p.m.
1995 – 30 May, 2.32 p.m.
2018 – 9 July, 2.13 p.m.
Recording equipment used: 1988 – Aiwa microcassette with tie-pin microphone; 1991 – Sony TCD D10 DAT recorder with ECM-MS5 one point stereo mic; 1995 – Sony TCD D10 DAT recorder with Sennheiser ME67 gun mic; 2018 – Olympus LS10 digital recorder with Sennheiser ME66 gun mic. Sonograms were made on a Mac using Amadeus Pro and Adobe Photoshop Elements.